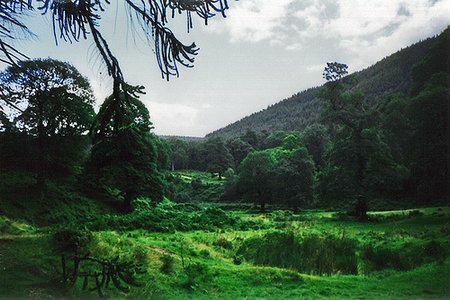 MT’s mention of the Wicklow Way in her recent post made me realize that I really don’t write about Ireland enough on this blog. So today I thought I’d redress that a little by sharing some photos of the scenery along this 127km trail which winds through the Dublin and Wicklow mountains. 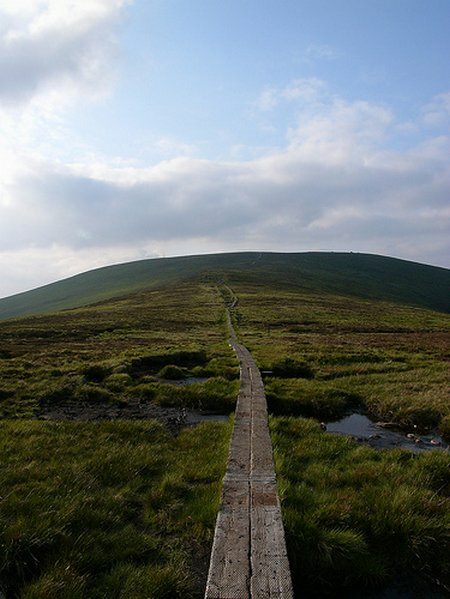 Mountains in Ireland are one of the reasons why it’s a fantastic family hiking destination. The mountains are old (literally, they’re ‘old fold mountains’ as opposed to ‘new fold mountains’ such as the Himalayas) and weathered and therefore perfect for hikes with young children who aren’t quite ready for steep inclines. Not to mention that in Ireland it’s hard to walk anywhere without having to pass a dell, glade or valley or even a pile of rocks which is named after a fairy, giant, prince or saint – all good fodder for young imaginations and a great way to distract from the efforts of hiking. 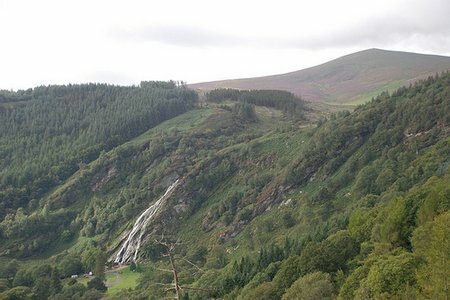 Powerscourt Waterfall with Djouce Mt in the background. And that photo, my friends, clearly shows why Ireland is called ‘The Emerald Isle’. 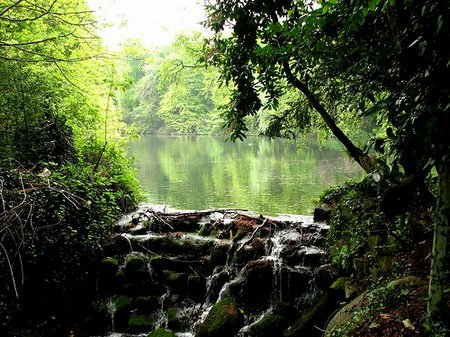 If you’re planning a visit, make sure you have good rain gear because there’s a price for all that greenery, and yes, it means that it rains in Ireland pretty much in every season. We stayed in this area on an extended visit to Ireland in 2000 and hiked around the Tibradden Mt. with our boys, then 4 and 6 months. The abundance of sheep was a fun distraction – especially when the sheep were looking in our kitchen window. For our trip, we rented one of these Dublin Cottages which I highly recommend. Head on over to DeliciousBaby for more Photo Friday fun. Reminder: If you were subscribed to my RSS feed from my old blog location, please don’t forget to re-subscribe using the new link. Thanks! This entry was posted in Activities And Adventures, International Escapades, Ireland and tagged Djouce, Hiking, Ireland, Powerscourt, Wicklow Way on October 8, 2009 by wandermom. How pretty! That green is absolutely beautiful! That’s some green landscape! I can smell the fresh air almost. Beautiful photos. Thanks for sharing Ireland with us! Those pictures of Ireland really make me want to go there, Ireland is actually on our list of places to visit. The green in the last picture is so lush that is almost unreal! Great shot, I also like the other two photos, especially the long trail. Love your new site banner! Ireland is one place I haven’t been, and is on the top of my list of places to go. Will have to show my husband your pics as a *gentle* nudge in that direction. Can’t wait to visit Ireland. Love seeing these beautiful pics. Will check out the cabins you mentioned. What’s the best time of year for a visit? P.S. Love the new look of your site. Okay now I want to hike in Ireland SOOOOOOO BAD!!!!!!!!!! I love Ireland, and now here’s ANOTHER reason for me to go back. Love your new look, by the way! Fab! I especially loved your first shot with the little waterfall.